Luca Curci talks with the artists Caius Rotaru and Alina Aldea during VENICE INTERNATIONAL EXPERIMENTAL | OUT OF BORDERS in Venice. Caius Rotaru was born in 1969, in ClujNapoca (Transilvania, Romania). 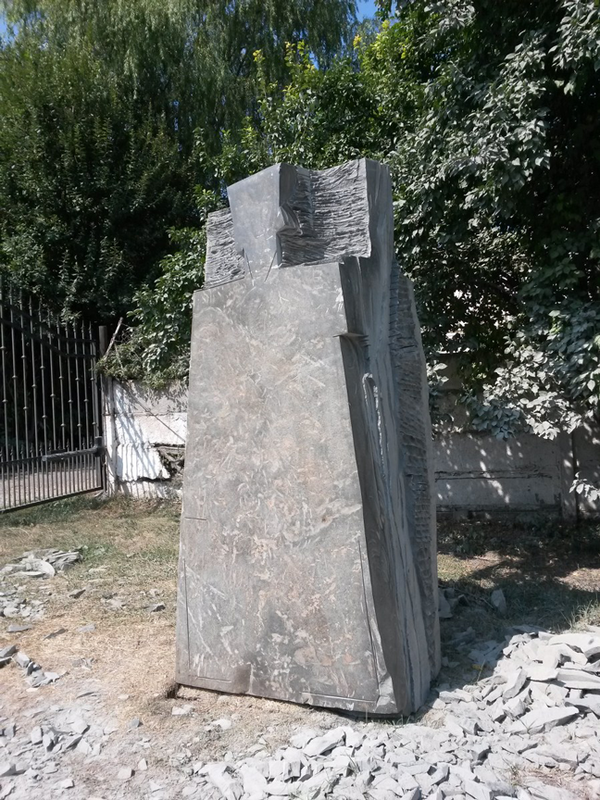 Formally trained as a sculptor at the National Art University from Bucharest, his education and personal research covers a wide range of cultural fields (literature, theatre, film). 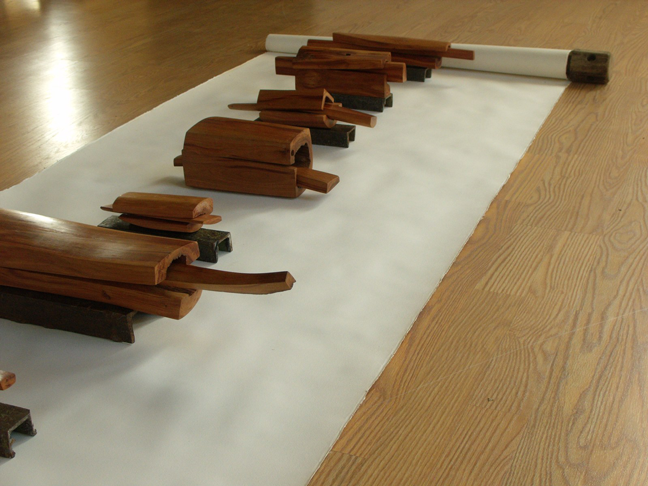 He started exhibiting in collective exhibitions and opened his first personal exhibition in 1999, then participated in several monumental sculpture workshops. For a while, he worked as a museographer. This experience influenced his artistic approach and was also helpful later, after 2010, when he co-curated several Romanian-Israeli exhibitions. 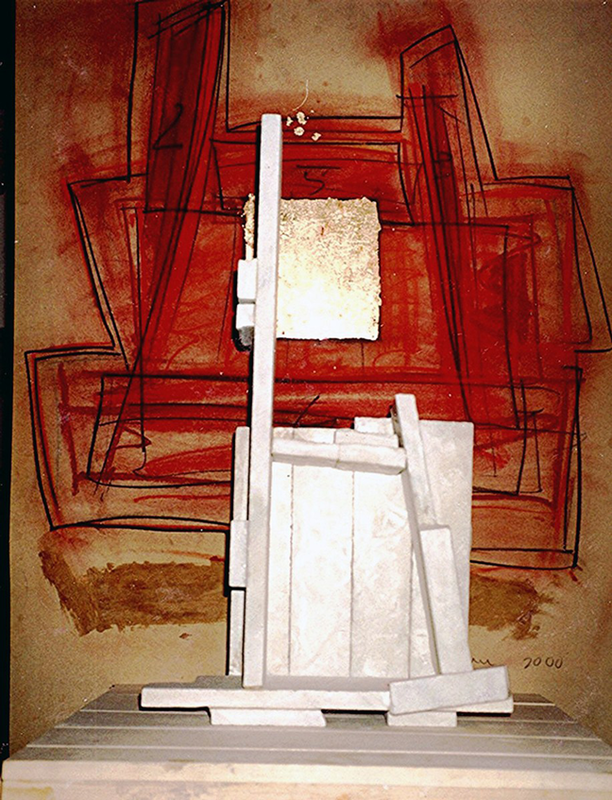 The line of his thaughts, ideas and discourses evolves in a straight course, starting from the “sculpture on pedestal” to objects and, more recently, installations. Alina Aldea lives and works in Bucharest, Romania, born in 1974. She graduated in 1999 the sculpture section at The University of Art Bucharest, The Faculty of Fine Arts; in 2001 she graduated the aprofundated studies at The University of Art Bucharest, The Faculty of Fine Arts, sculpture section; in 2005 did Master class at The University of Art Bucharest, The Faculty of Fine Arts, sculpture section; since 2011 she is Doctor of Visual Arts at The University of Art Bucharest, The Faculty of Fine Arts. Doing applied arts, she made sculptures, installation, objects, graphics, and not at least, interior design, creating an interdependence among all of them. Her extremely diverse concerns about arts, however, have one purpose: to capture at any scale, in any form, the ineffable aesthetic. Caius Rotaru – My artistic endeavor started as a refuge from the 1980s Romania, a dictatorial era, a place and time that was hostile to the contemporary creative freedom. My own way was underground, but influenced by so called classic periods and milestones of culture: Renaissance, Akiro Kurosawa movies, South-American literature (Borges, Llosa, Marques). In fact, my professional training is multidisciplinary, spanning all fields of culture. Alina Aldea – My artistic discourse is found equally in graphic works, sculptures, object, installation environment and interior design. I can not see any of them as being sufficient to exhaust my creative intentions. Thru installation or object I can articulate different materials such as feathers, mirrors, textile items, leather, etc. which allows me to support my project/concept by sensitivity and ineffable combination of materials. Thru bronze sculpture I do strength exercises making large works which explores the desire to fingerprinting and modeling the material. My drawings are immediate needs, impulses of the creative act. The interior design is the way to redeem through aesthetic means social needs. All of this completes, develops and inspires me for some form of representation. Beyond the form of representation I evoke and problematize: the construction or deconstruction, analytical vision or spontaneity, weightlessness, ephemeral, ambiguity and aesthetic relationship between works with space, using it sometimes speculative, as integral parts of the work. I can not pinpoint what inspires me, but it sure is an accumulation of personal stories, moods, emotions, reflections, aesthetic concerns, culture, and do not exclude, “oneiricstate” that Nietzsche and Jung say it takes a privileged seat regarding the structure of imagination, agreeing that the dream is big “supplier” of aesthetic content. L.C. – What is the message linked to the artwork you have shown in VENICE INTERNATIONAL EXPERIMENTAL | OUT OF BORDERS? How is it connected to the theme of the event? C.R. – Through my work, I aim to stimulate the viewer to reflect upon a world with no borders, no cultural constraints. Regardless of any political statement, I would like to open the viewer’s mind to one’s inner self, in the same time connecting the viewer to other´s open minds. A.A. – Interpretations and extrapolations of the theme could be “beyond the limits”, “beyond the concrete” or “beyond matter”. The thesis is interdependence of the beholder, calling upon reflexive human nature, it distracts from the real plan / actual mirror through which arranged face to face creates a multiplier effect, and in ideatic plan it propagates indefinitely. C.R. – My creative process takes a long time. 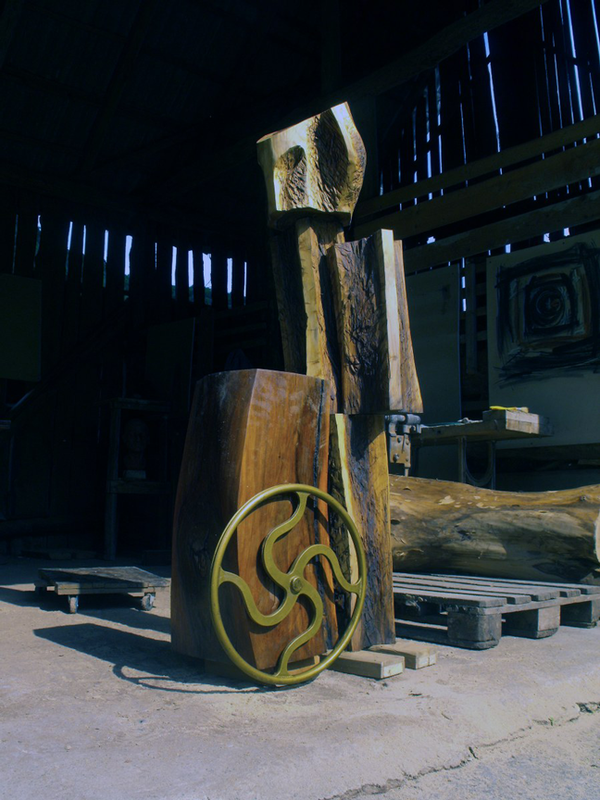 It’s very important but very difficult to put myself into the state of doing things, regardless of the technical skills acquired in time, working with a wide range of materials and techniques: bronze (clay modelling), marble, granite or wood (direct carving). A.A. – There are exercises of introspection and no matter what form of representation I want the project to be, I start drawing and write about it. The sketches have note, scales, adjustments, maybe small incoherences, which all in one day will be fixed and have an answer in my project. C.R. – Regarding myself and my art, I don’t pretend to change mentalities, political attitudes or influence global policies. Through my works, I hope to influence emotions or states of mind, even if for a moment, contrary to the art around me, that pretends to provide more and more power to change the world. Most of the today’s artists are deeply involved in politics and impose aggressive attitudes in a bid to change things, pretending to be equals to big corporations or organizations like Greenpeace, but only succeeding, from my point of view, to offer utopic alternatives. A.A. – Definitely very important, without them we would be deprived of culture, the grandeur of empires and asystem of values. With modern art catalysts we often see social phenomena, meaning the artist is either as promoter of exchanges of ideas that can be translated into cultural outlets or creating environments where people with certain affinities can be found in the same context. If I think of the design, concern that I have in past years, I would minimize the role of art if we look at it marginal, solving various functional aspects of a space or an object on aesthetic criteria, were the start of many historical periods of artistic phenomena reference as to Bauaus School, Art Nouveau, Art Deco, etc. It also can not ignore the impact of aesthetics in the social, manifested especially in recent years in relation to its role in the public and private sectors, generating addressing the aesthetics of a space, not infrequently, cultural identity and coagulation communities. C.R. – Yes. It offers good opportunities to get in contact with peers and people from all over the world interested in contemporary art, within a city rich in culture and history. C.R. – Liquid Group is an institution of the XXIst Century, within the European context, charged with civilizations, a meeting place for artists from all over the world. In the same time, its presence and services in the virtual world arean excellent tool for researches and curators. A.A. – I noticed a careful concern that the work is well represented being, a good promotion media and, not least, a permanent communication with the artists involved in the project. And about spaces where events unfolds, there is no doubt, are true architectural jewels!